The Watchman TV series has begun production, and to kick things off, we have our first official look from the series. Don’t get too excited, though – while the image shows someone in uniform, it’s probably not a superhero. The image certainly paints a portrait of a dark dystopian landscape, though. See the Watchmen TV series first look below. There you have it: our first look at Watchmen. Who is this mysterious masked police officer? Is this even a main character on the show, or just someone from the background? 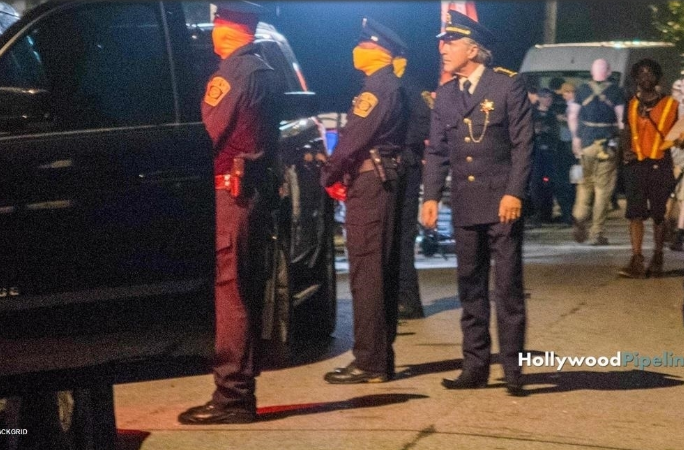 Previous set photos show several uniformed police officers standing around wearing similar yellow face masks, which indicates this could be the standard police uniform in the world in which Watchmen takes place. Faceless law enforcement officers certainly fits in with the proto-fascist world of the classic comic. Anticipation for HBO’s Watchmen is high. The graphic novel from Alan Moore and Dave Gibbons is a seminal work still held in high regard to this day. And while Zack Snyder already turned the comic into a film, the series is setting out to do something completely different. Rather than simply adapt Moore and Gibbons’ story, showrunner Damon Lindelof is instead telling a kind of sequel – a story set in the same world as the comic, 30 years later. We’ll no doubt get better looks at the show, its characters, and its world as production continues. For now, though, we’ll have to make due with this mysterious image. To help bring the series to life, Lindelof and company have assembled a cast that includes Regina King, Don Johnson, Tim Blake Nelson, Louis Gossett Jr., Adelaide Clemens, Andrew Howard, Jeremy Irons, Tom Mison, Frances Fisher and many more. Trent Reznor and Atticus Ross, who’ve handled musical scores for films like The Social Network and Gone Girl, are providing the music.